The Mayenne French-Style Completely Frameless Hinged Shower Door allows you to envision your bathroom as a boutique Gallic resort spa. Its minimalist, frameless designwork with matte black Blockpress mullion screening delivers a stylish contrast for your narrower existing shower alcove. Thick, premium 3/8 in. (10mm) tempered clear glass with StarCast interior glass coating and stainless steel constructed hardware provides your bathroom a high quality, low-maintenance showering experience every use. The Mayenne Hinged Shower Door is reversibly adaptable for left or right-hand installation. Allow your bathroom to exude equal parts vintage elegance and simplistic presence with this French-style frameless shower door, from Aston. Swing Shower door designed to fit 23.5-24.5" openings. 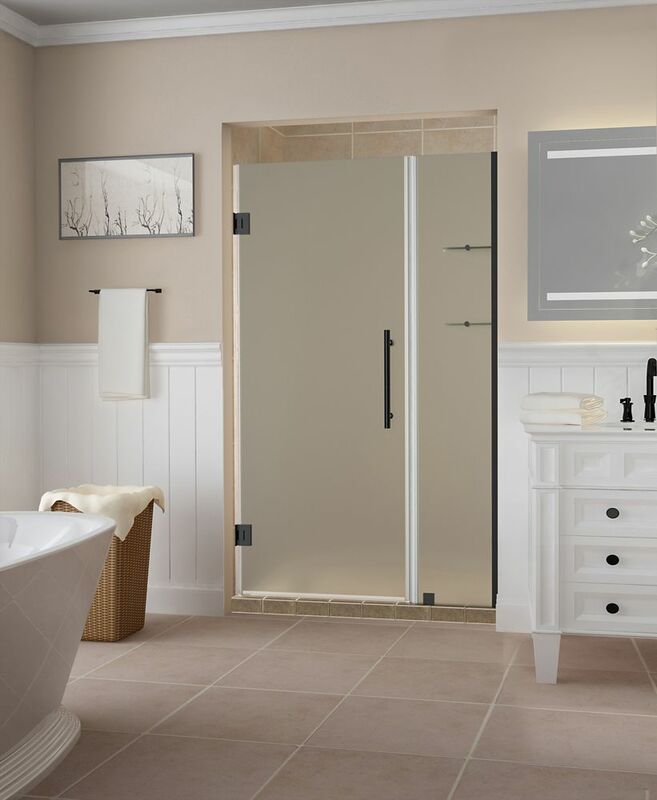 The Mirolin bypass shower door features a decorative frameless-look design and 8mm thick glass doors that provide a smooth, quiet gliding action. Belmore GS 38.25 - 39.25 x 72 inch Frameless Hinged Shower Door w/ Shelves, Frosted,Oil Rubbed Bronze The Belmore GS Frameless Hinged Shower Door provides universal sophistication and quality craftsmanship to your bathroom's decor. Available in a vast array of sizes, the Belmore GS is designed to meet the solution of uneven walls with its inline wall channel providing up to 1 inch out-of-plumb adjustment and offers the functionality of a built-in two-tier shelving system. The Belmore comes ready to install and will breathe new life into your existing bathroom's interior. The Collection is constructed with premium frosted 3/8 inch tempered safety glass; tested and certified to ANSI Z97.1 Standard, durable stainless steel constructed hardware, includes leak-seal edge strips and all models are engineered for left or right handed door installation. A perfect door with a perfect fit, only from Aston. Shower base not available. Images are for representation only. Once installed, glass may differ slightly than shown in image due to light absorption and reflection.